We live in a mile-a-minute world. Jobs, school, church, families, volunteer work, hobbies. Some days we barely have a minute to ourselves. Buy yourself some extra time by signing up for Mobile Banking. Instead of visiting one of our branches, you can take out your smartphone, tablet or other device, press a few buttons, tap the screen a couple times and manage your money in a matter of moments. The wise move is to use your smartphone. Using your mobile device to check your balances, pay your bills, and find ATMs is a real time-saver. It's also safe. Our Mobile Banking uses the same multi-layered security as your desktop computer. If you have questions about how these services work, check out our online tutorials and Mobile Deposit FAQs. Not only can you manage your accounts with your mobile device, but we'll send you alerts if there's something you need to know about your accounts or transactions. That camera on your phone? It can be used for something other than selfies. You can deposit most checks by downloading an app and then taking a picture of the front and back of your check. Within seconds, you'll receive confirmation that your transaction was successful. It's that easy! Let's get started. Download the Education First app from the iTunes or Google Play for your iPhone or Android smartphone. Use your built-in camera to take a picture of the front and back of your check. Don't worry, the Mobile Deposit software has an Image Quality Assessment tool that identifies any problems with the check image. If a problem is detected, you'll be asked to retake the photo. Hold on to the check for 7 days or until you have received confirmation of deposit. 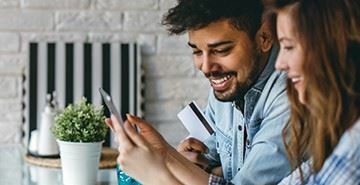 Checks payable to you and any joint owners of your Education First account, as well as business checks, can be processed through Mobile Deposit. Mobile Deposit features multiple layers of security, giving your account and check data the highest level of safety available. You can transmit mobile deposits to Education First 24/7. Deposits received electronically are processed similar to traditional paper deposits during the business day. The current daily dollar limit is $5,000.00 per business day with a maximum dollar limit per item of $3,000.00. Please read our Mobile Remote Deposit User Agreement and our Mobile Deposit FAQs to learn more.